Add chard stems to saucepan of boiling water; cook 2 min. Add chard leaves and corn; cook 1 min. Drain. Cook onions and garlic in dressing in large nonstick skillet on medium-high heat 2 min. Stir in chard mixture; cook 2 to 3 min. or until chard stems are tender, stirring frequently. Rainbow Swiss chard comes in bunches with red, yellow and white stems. If unavailable, you can use white or red Swiss chard instead. Since the chard stems are thicker and tougher than the leaves, boiling the stems first ensures that the leaves and stems are evenly cooked. Here's a delicious way to eat vegetables. 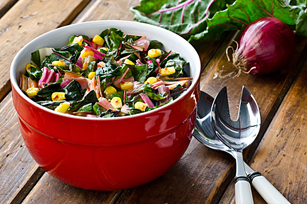 As a bonus, the Swiss chard provides an excellent source of both vitamins A and C.